The railway branch line came to Ashburton in 1872 (for more on this see the Travelling section under Gathering together). It seems likely that John Harris was stationmaster from the beginning, because in December of that year the death was announced at Ashburton of the wife of John Harris, stationmaster. Celia Farleigh Harris, aged 29, seems the most likely candidate - the indexes suggest that a John Harris married a Celia Farleigh Voisey in 1868. In the June 1877 quarter in the Plymouth registration district John Harris married Henrietta Voisey. The 1861 census for Harberton suggests that John's two wives were sisters. The 1881 census shows that of the four children a son, John, was born in Ashburton circa 1877; two year old Frank was also born in the town. John Snr. is now 41, and Henrietta Phoebe is 25. In 1892 Frank Harris was one of two candidates who won a two year scholarship at the Grammar School. Candidates had to be under 14, and to have received education at a public elementary school in the district for one year. John Harris died in 1903. £100 was raised in the town in recognition of the service given by the late John Harris. He had been the stationmaster for 31 years. Henrietta Phoebe Harvey Harris, a widow, is living with six of her children in Western Road in 1911 - probably the same house the family was living in in 1901, next to Waverly Hall. In 1901 Mary A. Voisey, mother-in-law to John, is staying with the family. Frank E. Harris returned to his mother's home in Western Road at the end of 1918. During the war he had served in South and East Africa, later joining the 2nd Devons and serving in France. He was badly wounded in France and was taken prisoner and had a 'very rough experience' whilst a POW. When Florence Harris died in 1919, she was described as the daughter of the late John Harris, who had been Station Master at Ashburton for some years. Her brother, Lieut. Frank Harris, was one of the mourners. 1921 Frank Harris, son of Mrs. Harris of Western House, was decorated with the Distinguished Service Order at Buluwayo, South Africa. He had served with the Devons in France in the war. In 1934 Capt. F.E. Harris accepted a position in Agriculture in Rhodesia. He was described as the second son of the late W.J. Harris, stationmaster, and Mrs. Harris of 42 West Street. 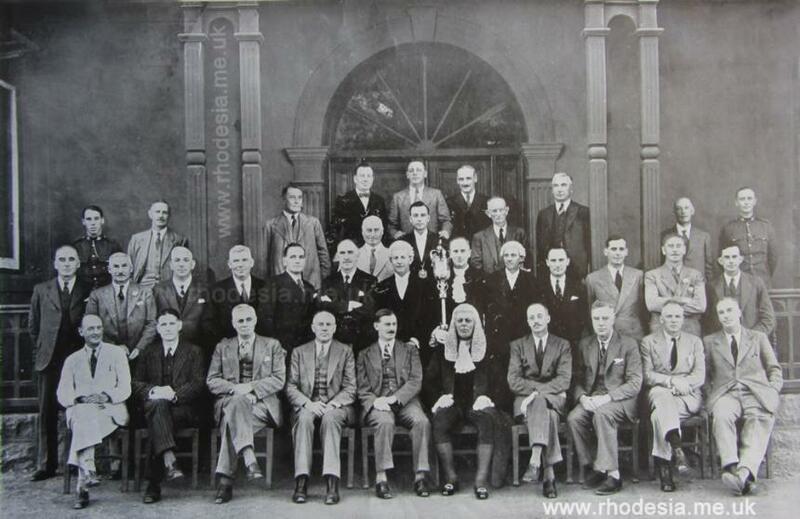 Above: The Rhodesian Parliament 1935. Frank Harris is in the front row, second from the right. 1937 The Hon. F. E. Harris DSO, Minister of Agriculture for Southern Rhodesia, returned to Ashburton to spend Christmas with his mother, 80 year old Mrs. H. Harris. When interviewed by a reporter from the Exeter and Plymouth Gazette, he said that he had been a grocer's assistant, who had left the country in 1902. He was investigating the export of tobacco, beef and maize from Rhodesia to Britain. He also stated that emigrants from Britain would be warmly welcomed. 1946 Henrietta, widow of the late John Harris, died aged 88. She was living at 6, Vealenia Terrace at the time.